Irja was born in Norway, and was equally proud of her heritage and her US citizenship. 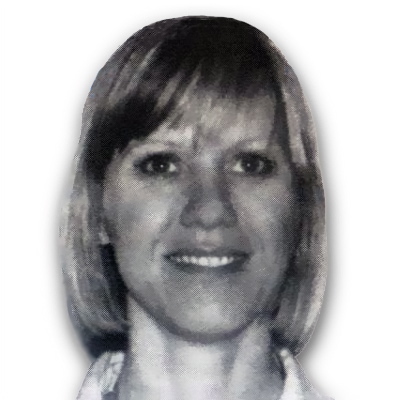 She took her job responsibilities seriously and was known as a dynamic and hard working person who consistently went above and beyond the call of duty for her passengers and her flying partners. One passenger commendation said it quite clearly: “The attentiveness and courtesy that Irja extends lies beyond words.” She was particularly devoted to her seven year-old son, Kevin. Her husband, Bjorn, wrote that Irja was, “A loving mother to her son and an exciting life partner to me.” In her free time, Irja frequently guided physically and visually disabled people on cross-country ski adventures in the United States and in her native Norway. 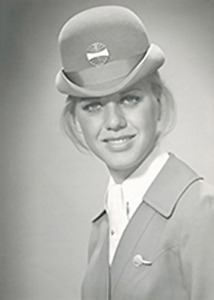 Irja began her career with Pan Am in 1972 and was based in Miami, Los Angeles, New York, and San Francisco before joining the London base in 1987. Irja is survived by her husband, Bjorn Skabo; her son, Kevin; her parents-in-law, Eivind and Mary Skabo; her sister, Ingrid, and her brother Jorgen. Irja dons her Evan Picone designed stewardess uniform in her 1972 Pan Am graduation photo. Ann Wilkerson: The blond blue-eyed Scandinavian girls in my training class were role models for us Americans, and I aspired to be more like these worldly, sophisticated, and gorgeous twenty-somethings. Irja was one of these icons, smart as well as beautiful, and of course she spoke multiple languages. Her vivacious smile and twinkling blue eyes gave away her naughty sense of humor. After training, we were both based at JFK, but then life decisions led us to different bases, and Irja went to London where we lost touch. Flash forward 16 years to that darkest night that we call “Lockerbie.” I soon learned that Irja was a PA103 crew member and that she had a young son who would now be growing up without his mother. When I think of Irja now, I don’t picture the young woman I knew in training in Miami Springs. My remembrance of her is how I imagine she would have been as a mother who also flew for Pan Am. When she kissed her son goodbye for that trip, there would have been no way to imagine the tragedy to come. I grieve for Irja, and I grieve for her son, who would be a young man now in his late 20’s. I hope his life has been blessed in many ways despite the loss of his funny, warm, bubbly, mother, gone too soon in a senseless act of terrorism in December 1988. Romlee Stoughton: Irja commuted from my flat. I always enjoyed when she was over. My heart was especially broken knowing her little boy lost his mother. Debbi Martin Fuller: I don’t remember the exact date of the flight, but I have a very clear memory of being in my hotel room in India with almost the entire crew drinking beer and laughing about our flight and Irja had brought along her lovely sweatshirt/sweatpants combos that she made with lace on the collars. We all tried them on and a lot of us bought one from her. I remember that mine was peach and I wore it for several years. I remember Irja well. We met in Vail, in 1975 and saw each other often for a time. In addition to being beautiful, smart, fun, and engaging, she was a good person. We lost touch in 1976. I still think of her often.